An article in today’s Chicago Tribune reports that the Simplicity 4-in-1 and 3-in-1 co-sleepers have been implicated in two infant deaths, the most recent was last Thursday in Kansas. 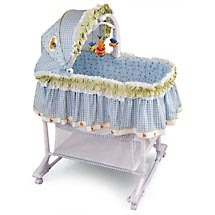 Though these bassinets have not yet been recalled, any parent with one should stop using it and discard it immediately. There appears to be a design flaw that allows the baby to slip through and become trapped.